All aboard! 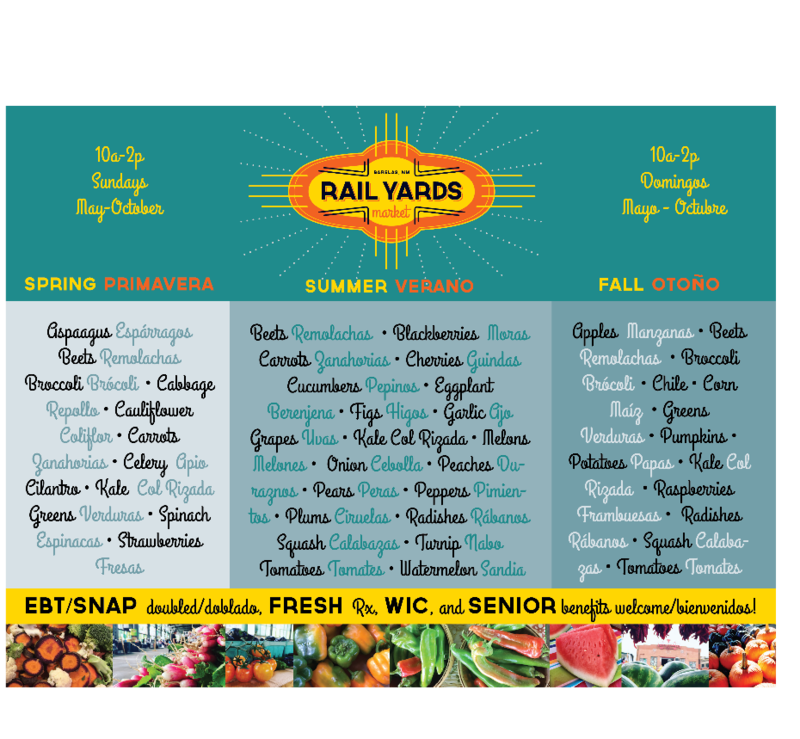 The Rail Yards Market, Albuquerque's iconic Farmers' Market is slated to re-open on May 5th, 2019. The market will bloom into its sixth year since opening in 2014, and hosts over 100 vendors of fresh produce, fine food, healing hands, and handmade art. Spring couldn't be here fast enough, as farms, foodies, artisans, and organizers chug along to prepare the finest Growers' Market experience for locals and tourists alike. The theme for the Rail Yards Market's grand opening is Traditions. The cultivation of our food, telling of stories, teaching of techniques, passing on wisdom, and so much more are important ingredients of our culture and rituals of our existence on this realm. Celebrate our traditions unique to New Mexico and indulge your loca-vorian spirit at the Rail Yards Market! Free for all! Everyone is welcome! ~Traditional Spanish Colonial Embroidery Technique by Annette Gutierrez Turk with El Rancho De Las Golondrinas :: Annette is a colcha embroidery artist, who will demonstrate the Spanish Colonial embroidery technique to visitors. She is a juried artist in the Spanish Colonial Artist Society and can be found at Spanish Market each year. Annette weaves her base fabric, dyes the yarns and designs her own work. She has taught locally, regionally, as well as internationally. Her work is in the collections of the Museum of Spanish Colonial Art in Santa Fe and the Guizhou Ethnic Cultural Museum, Guiyang, China. ~Traditional Healing Medicine Using Native Plants by The Yerba Mansa Project :: Join Yerba Mansa Project Director, Dara Saville, for this free talk and demonstration of how we can use local native herbs and plants for healing. Learn how to make a tincture and take home some complete knowledge of how to utilize natural surroundings to support your health. Play LOTERIA in the kids zone! This traditional game, similar to bingo, is played during most hispanic festivities and is a great bilingual activity for everyone! Rail Yards market: What's In Season? Vendor application open until feb 1st! FREE VENDOR APPLICATION WORKSHOPS Jan 18 & 25th! Intro Workshop Jan 18th (recommended for new vendors): What you need for this workshop: Yourself and an email account. We will answer..
How do you apply for the Rail Yards Market? What types of Vendors can apply? What permits, registrations etc are required? What are the basic functions/areas of the vendor online system? What does your jury look for? FREE SQUARE SMALL BUSINESS WORKSHOPS Jan 23-26th! Join Square with Visa, the City of Albuquerque, Accion, the American Indian Chamber of Commerce, the Albuquerque Hispano Chamber of Commerce, Three Sisters Kitchen, African American Performing Arts Center, the Indian Pueblo Cultural Center and the Rail Yards Market of Albuquerque for a series of FREE interactive small business events! Lunch and refreshments will be provided at all workshops. Register NOW CLICK HERE! Click the link above to sign up today and join us! We are overwhelmed with joy! 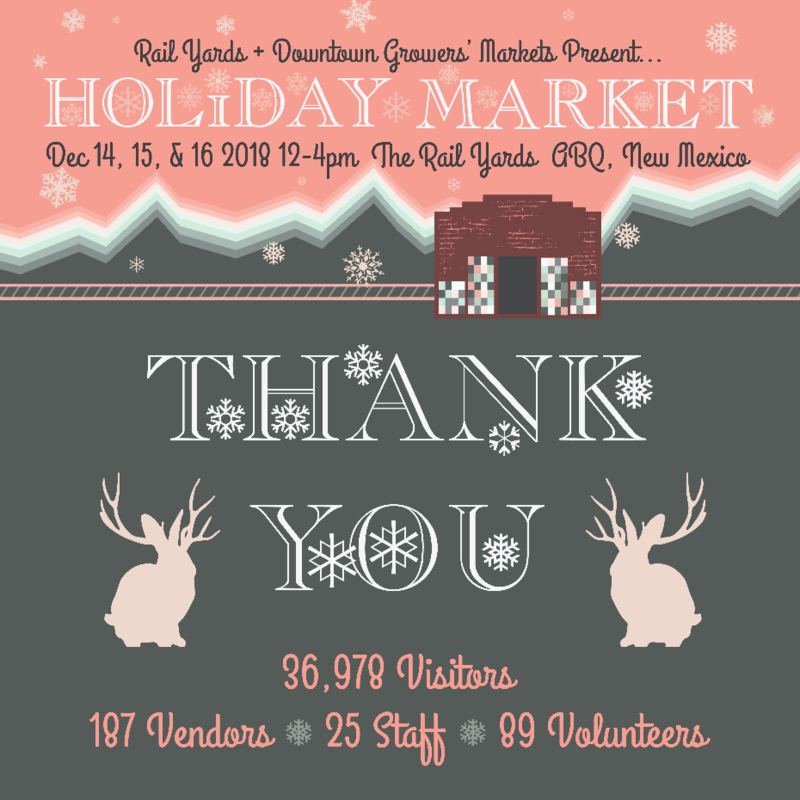 Big thanks to all of the Burquenos and visitors that came out to the 2018 Holiday Market! Together we welcomed over 30,000 visitors over the weekend, and want to sincerely thank everyone for their support. With everyone's generous support we were able to expand market infrastructure, parking and shuttle options. Please visit our Facebook page for many photos of the event! Need to find a vendor? See our HOLIDAY MARKET MAP & VENDOR LIST HERE. The City really came together to support this non-profit event in a huge way! Much gratitude to the City of Albuquerque Cultural Services, Economic Development, Planning, Transportation, and Police Services departments. 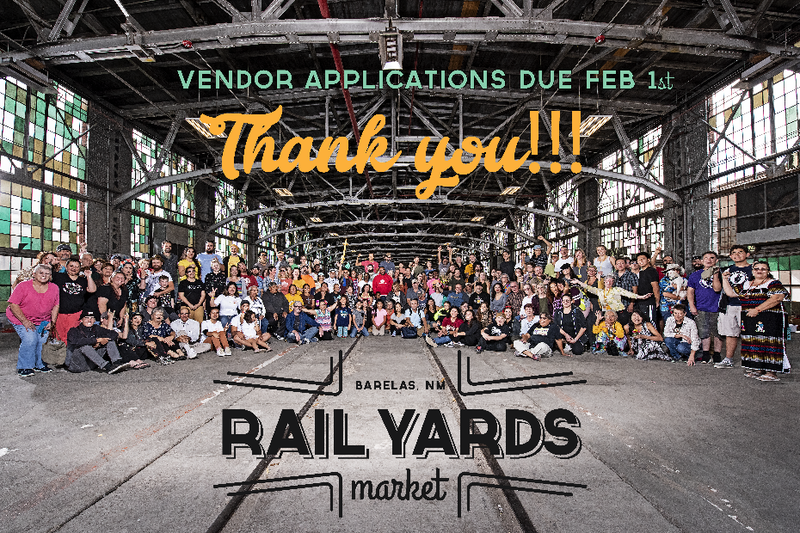 The 2019 Vendor Application is open now until Feb 1st. We welcome farms, food makers, healers, and artisans! Thank you to our Sponsors & Community Partners!